Iris 2 is a visual instrument that lets you create and discover musical sounds that have never been heard before. An inspiring and playable sample­based synthesizer, Iris 2 combines the power of a sampler with the flexibility of a modular synth. Get started fast by selecting from hundreds of expertly crafted patches, then immediately tailor them with simple Macro Controls built right into the Patch Browser. Build custom patches quickly by layering audio samples from the included 11 GB library or by uploading your own WAV and AIFF files. Apply modern modulation, filters, and effects to reveal an entirely new palette of musical possibilities. With Iris 2, designing musical sounds has never been so creative, intuitive, and fun. The sonic options are limited only by your imagination! Iris 2’s modulation system was completely rebuilt from the ground up. Now, over 100 parameters can be modulated—using up to five LFOs, five Envelopes, MIDI Expression Controllers, and Macro Controls—with a simple, single­click­and­drop assignment system. Enjoy increased flexibility with a sample pool that allows you to load any sample. Additionally, dozens of classic analog oscillator samples or oscillator waveforms (OSC WAVs) are now available in all four sample pools, quickly accessible right from the empty spectrogram. Get inspired by a wealth of creative tools at your fingertips. Each knob, button, panel, feature, and workflow has been reviewed with input from dozens of artists and users to introduce new possibilities into your musical process. Quickly identify the effects of your spectral filtering and processing. Every modulated parameter meters the effects of modulation in real time, and a version of the spectrum analyzer from our award­winning Insight metering suite is included right in the master section. Unleash the full power of iZotope’s award­winning signal processing technology, including distortion and filters from Trash 2, a crystal­clean new delay, and modulatable controls of nearly every parameter within the Multimode Master Filter and four effects processors. 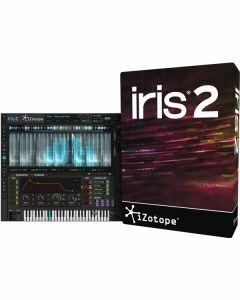 An epic library of content is included with your Iris 2 purchase: an 11 GB sample library (all provided as 24­bit .WAV files for use in any sampler) and hundreds of exciting new patches by world­class sound designers. Define your sonic signature: Start creating instantly by loading one of hundreds of fresh and inspiring patches, then immediately tweak the most important parameters with eight Macro Controls. Build your own synth: Create sounds that are completely your own by layering up to four different samples from a built­in collection of analog oscillator waveforms, an 11 GB sample library, or your own personal audio files. Create your own filters: Get the best­sounding and most unique filters by drawing, selecting, and isolating sonic components from each sample layer using iZotope’s award­winning spectral filtering technology. Shape your own sound: Develop expressive, dynamic, and evolving musical sounds with the powerful and flexible new modulation system. Access every control from one window, or reveal only what you need with a dynamic new user interface.